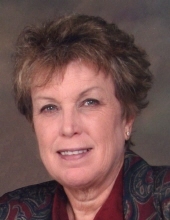 Brenda Ilene (Kinslow) Hemphill, age 68, died Wednesday, January 16, 2019. She was born September 6, 1950 in Heavner, OK to Byron and Ivy (Harris) Kinslow. She was a 1968 graduate of Redlands High School in Redlands, CA. Brenda married the love of her life Rodger Hemphill on December 25, 1967. They eventually moved to the OKC area in 1981. She worked for Skaggs and Alpha Beta grocery stores and also worked for Putnam City School District in the cafeteria preparing meals for the students and faculty. Brenda was most known for her cookies, she would deliver homemade cookies to schools that her children attended and on occasion she played the accordion at school celebrations. She would also open her home to the neighborhood kids to help bake and decorate cookies. Brenda was also known for dressing up as a clown for every Halloween to pass out candy. She was preceded in death by her parents, brother; Arvel and sister; Margie Neal. Brenda is survived by her husband Rodger, son; Michael and wife Taryn and daughter; Shellie Hill and husband Danny, seven grandchildren; Ashley Masterson (Chris), Blake Albright (Jenna), Summer Witten (Sean), Megan Bentley (Grant), Chandler Hemphill (Bailey), Kaylyn Fricker (Jack), Kylee Pargeter, nine great grandchildren; Ethin, Ethan, Aidan, Wyatt, Kenzlee, Braxton, Kateleja, Avery and Ella and one soon to be here; Gracelyn. Also, by brothers; Marvin (Mary) and Ralph (Rena), sister Bonnie Epperson and sister-in-law Elaine Kinslow. A celebration service will be 10:00am Friday, January 25, 2019 at McNeil’s Funeral Services, Mustang, OK, with a private family interment in the Mustang Cemetery, Mustang, Oklahoma. To send flowers or a remembrance gift to the family of Brenda Ilene Hemphill, please visit our Tribute Store. "Email Address" would like to share the life celebration of Brenda Ilene Hemphill. Click on the "link" to go to share a favorite memory or leave a condolence message for the family.